1.5 x 3.5 is a single-channel generative animation by Joelle Dietrick and Owen Mundy, currently displayed in the Orlando Museum of Art’s New Work Gallery. The title 1.5 x 3.5 is the actual measurement for a 2 x 4 inch board. Ubiquitous as an article for the construction of buildings, as well as a formal, minimal, primitive shape, the 2 x 4 here is transformed through its incorporation into a virtual space. The simulation of the generic form becomes an index for any building material, physical or digital, and its manipulation, a metaphor for the fragmentation of digital communication. 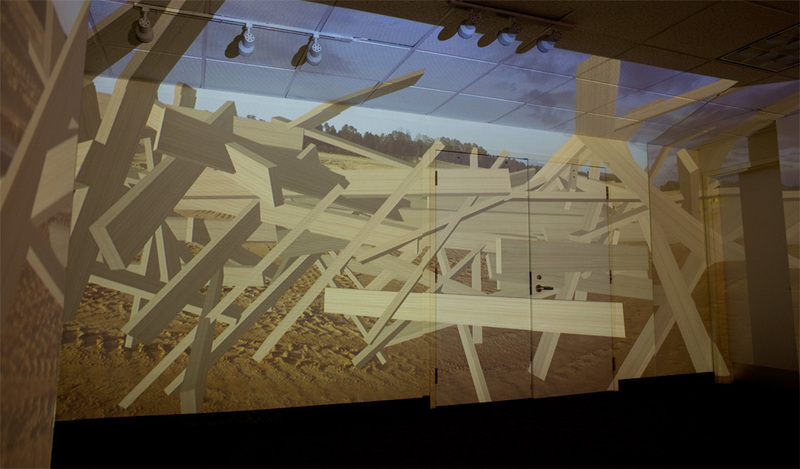 As the main character in their animation, the 2 x 4 is virtually constructed then multiplied and subtly manipulated to form an evolving cluster floating above a photograph of a contemporary construction site. From a housing development just northeast of Orlando, nestled between the Florida Turnpike and Old Country Road 50, this backdrop also calls to mind another space described by the minimalist sculptor Tony Smith. Smith describes a drive down an unfinished highway as a sublime experience. The highway’s liminal state-imagined, artificial, and full of potential-liberated Smith’s assumptions about art. 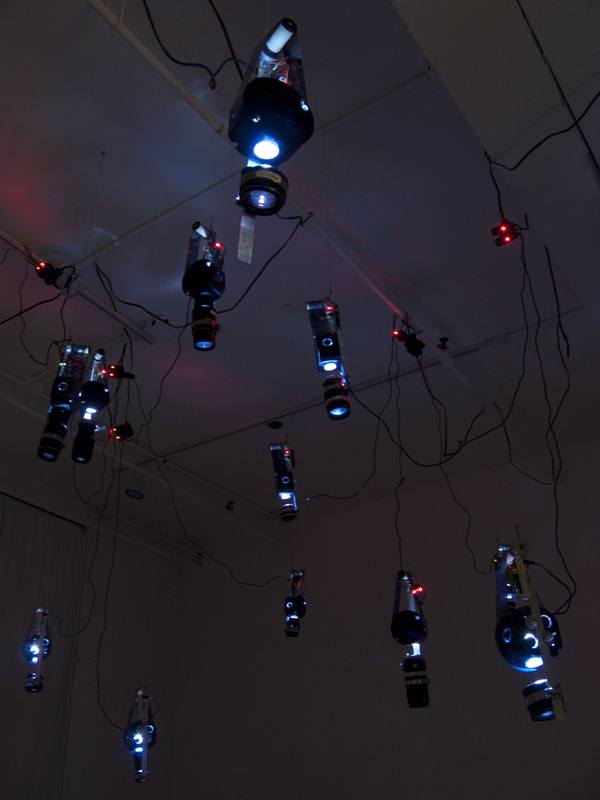 1.5 x 3.5 grows out of their recent series of installations, prints, and public artworks called Packet Switching. This body of work uses custom software to visualize architecture as fragments affected by economic and communications systems. 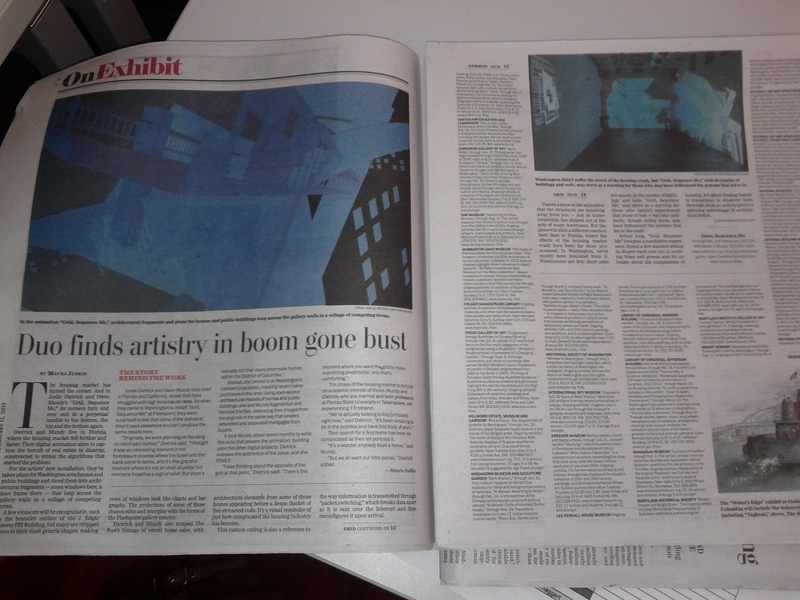 The Washington Post recently published a review recently about my and Joelle’s exhibition at Flashpoint Gallery in D.C. 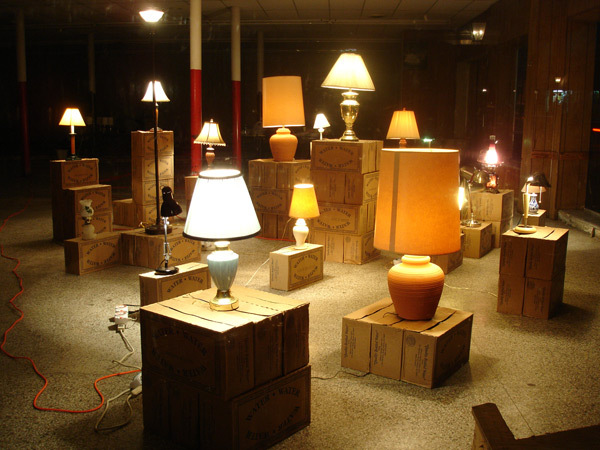 Check it out: Joelle Dietrick & Owen Mundy: Grid, Sequence Me, by Maura Judkis, Jan 11, 2013. A few elements will be recognizable, such as the brutalist outline of the J. Edgar Hoover FBI Building, but many are stripped down to their most generic shapes, making rows of windows look like charts and bar graphs. 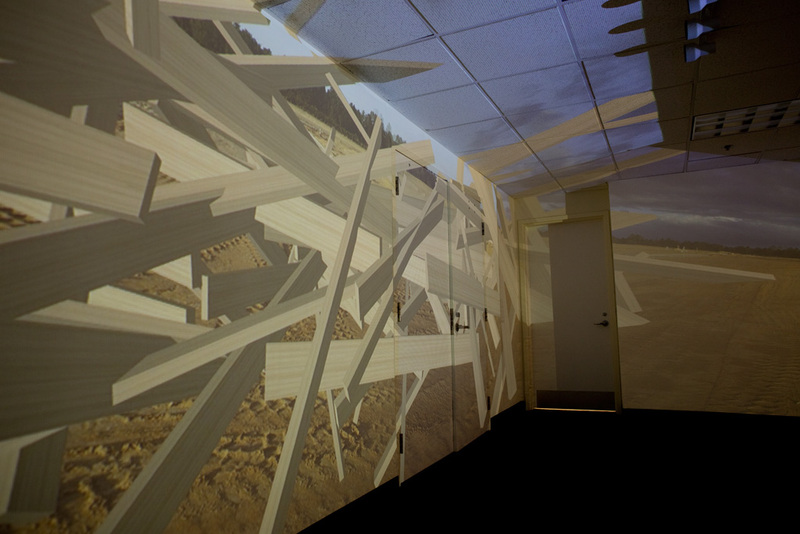 The projections of some of those shapes echo and interplay with the forms of the Flashpoint gallery interior. Dietrick and Mundy also scraped The Post’s listings of recent home sales, with architectural elements from some of those homes appearing before a dense thicket of live-streamed code. It’s a visual reminder of just how complicated the housing industry has become. There’s a sense in the animation that the structures are tumbling away from you — just as homeownership has slipped out of the grip of many Americans. But the piece will elicit a different reaction here than in Florida, where the effects of the housing market crash have been far more pronounced. In Washington, we’ve mostly been insulated from it: Foreclosures are few, short sales are sparse. In the jumble of buildings and code, “Grid, Sequence Me,” may serve as a warning for those who haven’t experienced that sense of loss — but who indirectly, though policy work, may have influenced the systems that led to the crash. I also finished a short piece with video from the installation and screen captures of the Processing visualization. I am tele-participating in a one-week online performance of Google queries at Transmediale 2012 in Berlin. 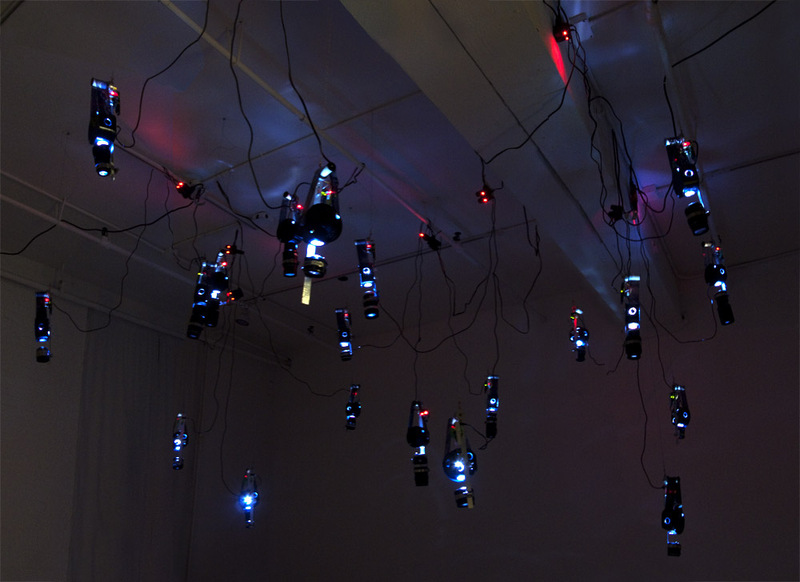 The project, plainly titled, “Google,” is organized by Johannes P. Osterhoff and will run from Jan 30 to Feb 5, 2012. Each participant edits the search method for their browser search bar so that everything they type in this box, from the personal to the mundane, becomes instantly visible at google-performance.org. The project (“manifesto” below) makes public what Facebook, Google, and any online search engine, crowdsourcing website, or social network already does by harvesting searches from users, and re-representing that data in a new context. While Google uses these queries to build and sell condensed user demographic data to advertisers, Osterhoff’s project asks, who actually owns your search data? We shall do an one-week performance piece. 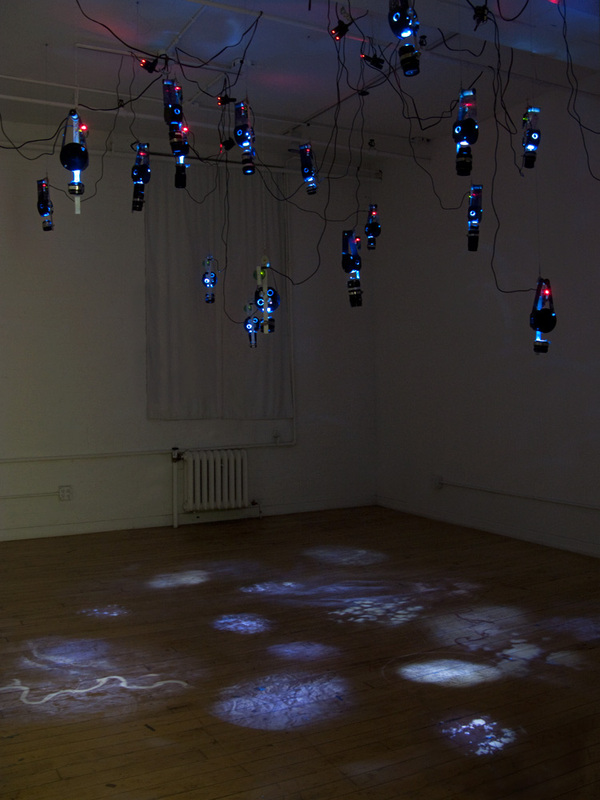 The piece is called “Google” and documents all searches we perform withthe search engine of the same name. The performance shall take place during transmediale 2012 and shall start on Monday, January 30 and shall end on Sunday, February 5, 2012. We shall not use undocumented ways to use the search engine Google during this time. Each of our search queries shall create a web page that is indexed by this search engine and thus makes our searches publicly available as search results for everybody. Howdy, it’s been awhile since I last shared news about recent and ongoing projects. Here goes. You Never Close Your Eyes Anymore is an installation that projects moving US Geological Survey (USGS) satellite images using handmade kinetic projection devices. Each device hangs from the ceiling and uses electronic components to rotate strips of satellite images on transparency in front of an LED light source. They are constructed with found materials like camera lenses and consumer by-products and mimic remote sensing devices, bomb sights, and cameras in Unmanned Aerial Vehicles. 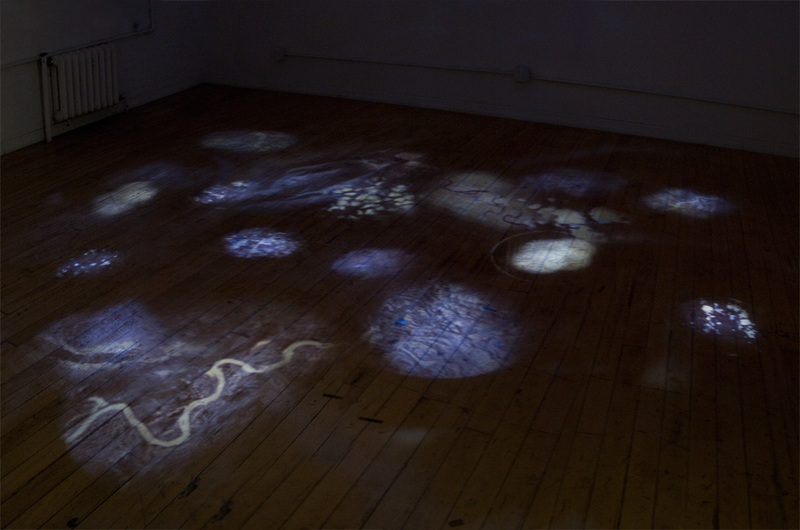 The installation includes altered images from various forms of lens-based analysis on a micro and macro scale; land masses, ice sheets, and images of retinas, printed on reflective silver film. Give Me My Data is a Facebook application designed to give users the ability to export their data out of Facebook for any purpose they see fit. This could include making artwork, archiving and deleting your account, or circumventing the interface Facebook provides. Data can be exported in CSV, XML, and other common formats. Give Me My Data is currently in public-beta. 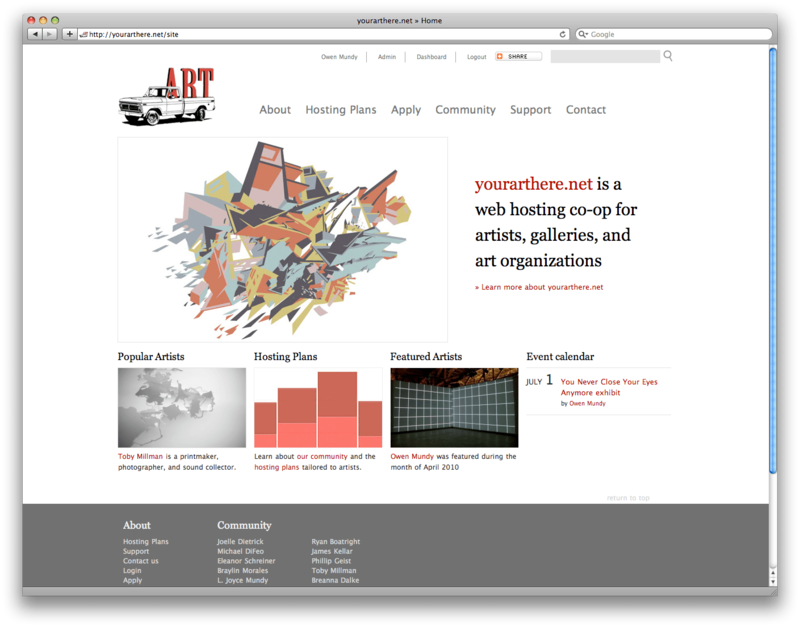 A major server and website upgrade to the yourarthere.net web-hosting co-op for artists and creatives. The new site allows members of the community to create profiles and post images, tags, biography, and events. In addition to the community aspect, yourarthere.net is still the best deal going for hosting your artist website. 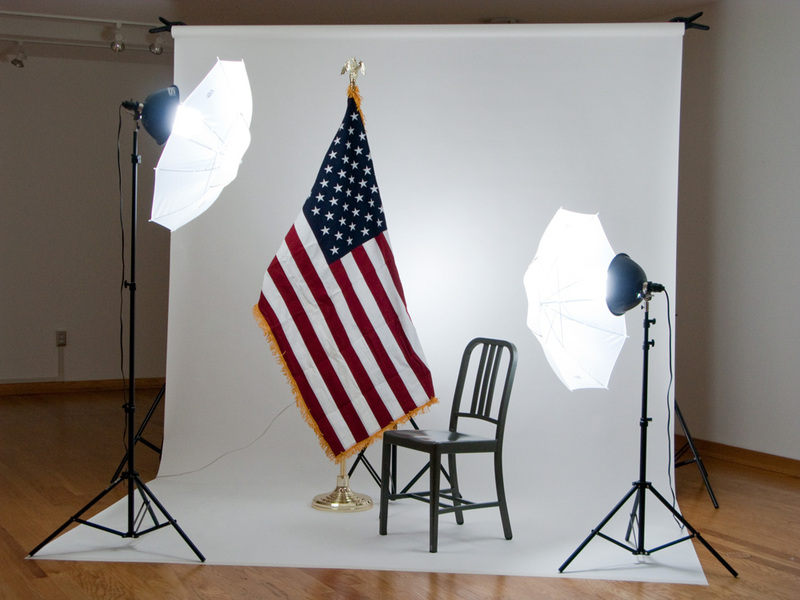 The Americans is currently on view at the Northwest Florida State College in Niceville, FL. It features a new work with the same title. I recently designed a new billboard hanging device and installed it in downtown Bloomington, IN with the help of my brother Reed, and wife Joelle Dietrick. Stay tuned here for news about Your Art Here and the new billboard by Joelle Dietrick. 8. Finally, moving to Berlin for a year on a DAAD fellowship to work on some ongoing projects, including Automata. I’ll be giving a paper about Automata at the upcoming ISEA2010 conference in Ruhr, Germany. I am very much enjoying the video my friend, Asa Gauen, is working on for You Never Close Your Eyes Anymore, which is installed at AC Institute in New York until July 31. You Never Close Your Eyes Anymore opens tonight at AC Institute in Chelsea. Keyword Intervention has been included in the recent HZ Net Gallery update. Also included were: Alysse Stepanian, Rudi Punzo, Aaron Oldenburg, Aaron M. Higgens, Anders Bojen & Kristoffer Ørum. 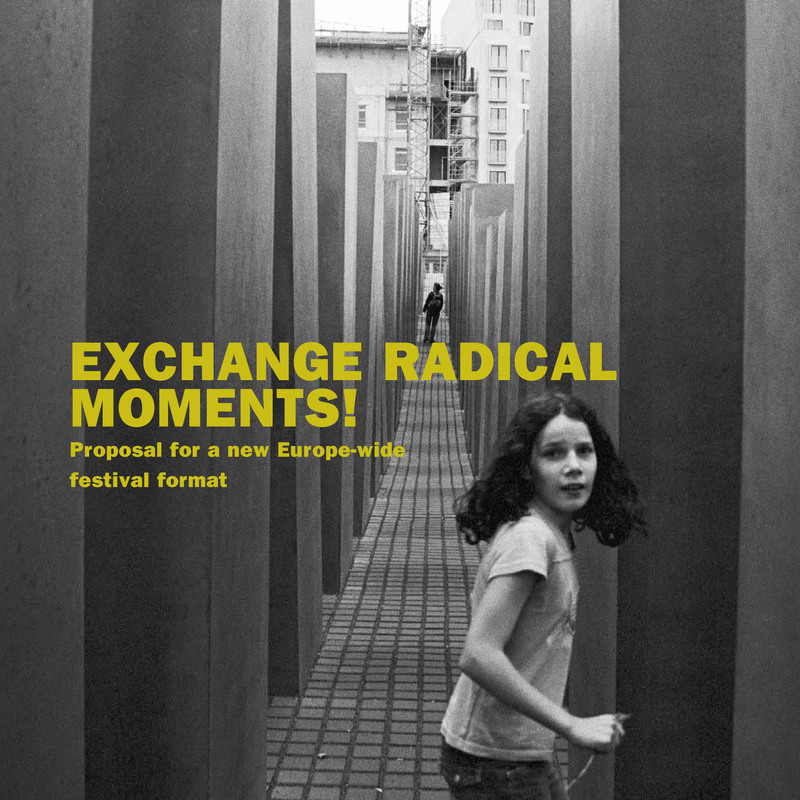 Joelle Dietrick and I have been selected to participate in the upcoming Europe-wide Art Festival Exchange Radical Moments! Organized by Austrian collective, Die Fabrikanten, the festival includes interdisciplinary projects exploring the nature of contemporary Europe and will culminate on 11.11.2011 as a moment of simultaneous fruition. 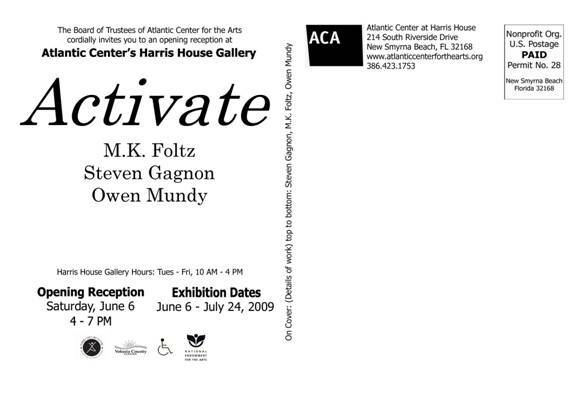 Featured participants include Gabriela Gerber and Lukas Bardill; Scott Bunham and Juliane Stiegele. Download the promotional magazine here. A touring exhibition at Broadwalk Arts, Bristol then at The Willesden Gallery, London includes national and international artists and writers exploring the notion of connectivity, correspondence and dialogue entailing a subversive perspective to the theme. Subversive Correspondence #1 Broadwalk Arts, Bristol, BS4 2QU. The Gallery at Willesden Green, 95 High Road, Willesden, London, NW10 2SF. The interpretations encounter political statements or disperse cultural observations; correspondence that is not immediate but perhaps depends on the contingencies of travel. 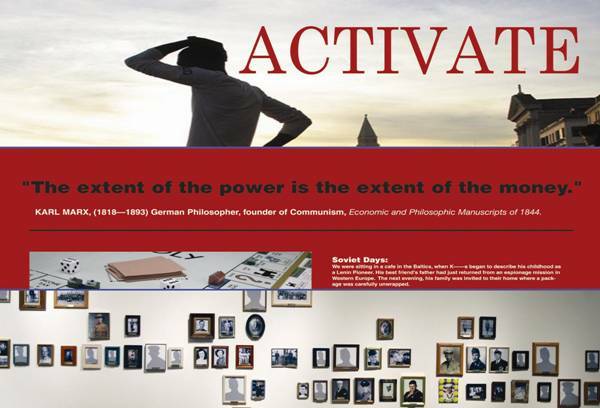 Subversive systems of posting and collecting dialogue create the emergence of new narratives that are shared and reacted upon through hybrid texts, images and temporary ownership. Show cased as a touring exhibition at Broadwalk Arts, Bristol then at The Willesden Gallery, London, the works continue to explore language, visual interchange and systematic dialogues. Entries (RSS) and Comments (RSS). 64 queries. 0.929 seconds.